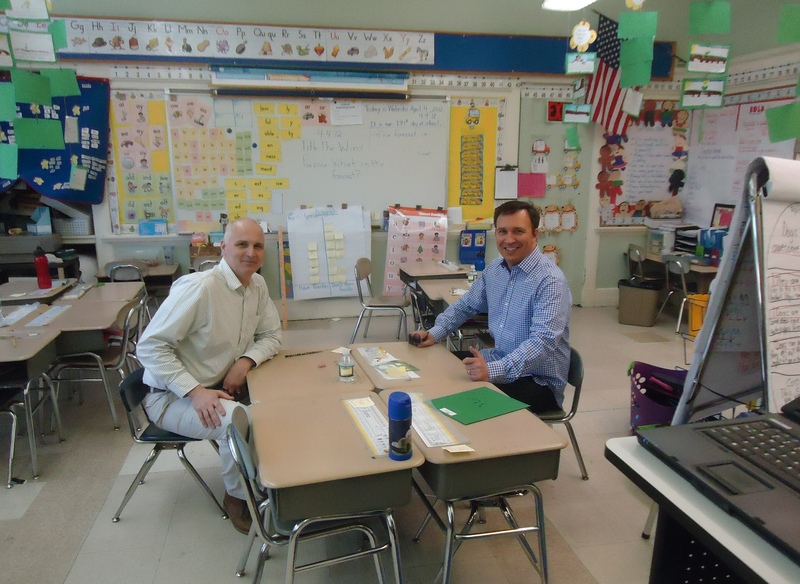 Back in the 1970s when two kids were sitting in Miss Colleran’s 5th grade classroom at the Balch School in Norwood, Massachusetts , could anyone have guessed they would be working in television some 40 years later? Was it the Watergate hearings that dominated the television airwaves then, the Mary Tyler Moore show about a fictional TV station, or watching Ken Coleman and Johnny Pesky broadcast Red Sox games? Whatever inspired those boys to later make television their careers, was cultivated on some level at this historic elementary school. 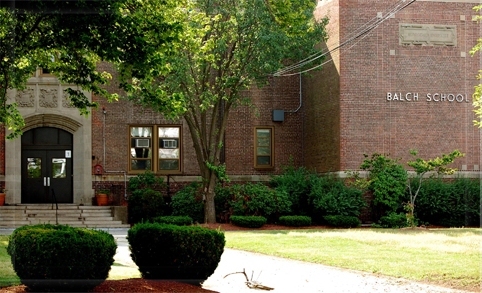 I recently had the chance to return to Norwood and “the Balch,” as it is called, thanks to an old friend I hadn’t seen in decades, who is an invaluable asset to my hometown. Jack Tolman is the longtime general manager of NPA-TV, Norwood Public Access Television, and an unofficial historian of the town. When Jack invited me to see the new NPA studios and visit “the Balch,” I made plans for the 100 mile trek from Hartford to Norwood, pronounced “Naw-wood,” by some locals. Jack has made a name for himself with some excellent work digging through old film and telling the stories of some key figures in Norwood history, educating and entertaining townspeople and preserving these productions for future generations. Under his guidance, NPA has produced special documentaries on several folks including former major league baseball player Richie Hebner ( arguably Norwood’s most favorite son,) and Colonel George Lee, a Norwood native turned heroic fighter pilot in World War II. I hadn’t heard of Lee until the special, and now because of Jack’s research and discovery of rare old film, Lee is a household name in town, as he should be. Jack also edited the first music video for the “Mighty Mighty Bosstones,” whose lead singer Dicky Barrett, is also from Norwood. Barrett is now the announcer for the Jimmy Kimmel Show and we were on the same Pop Warner team a zillion years ago. Seems I’m always finding some Norwood connection to everything. This constantly amuses my wife, whose Detroit suburb where she grew up is not nearly as ubiquitous as Norwood. Kara is amazed how we always run into someone I know when we visit Norwood. Maybe because I’m a fourth generation Norwoodite? My great grandparents Paolo and Maria Chiulli emigrated here from Italy about 100 years ago. All of this documentary work is done through NPA-TV, which is hardly your ordinary suburban public access organization. They have a brand new state of the art studio, with the most advanced equipment. Trust me, I have been in and worked in commercial television stations that don’t come close to NPA. Students at Norwood High School are learning more about television production than some college students. I briefly talked to some of the students during my visit and told them to take advantage of these tremendous resources at their disposal. Few high schools, if any, have the television program that Norwood has. There are undoubtedly more NPA specials to come. There is a box of old film waiting to be studied and created into something. Jack told me there is even one old film that contains a brief scene of a very young Dennis House talking to a teacher. The film is in fragile condition and we need to figure out how to save it. 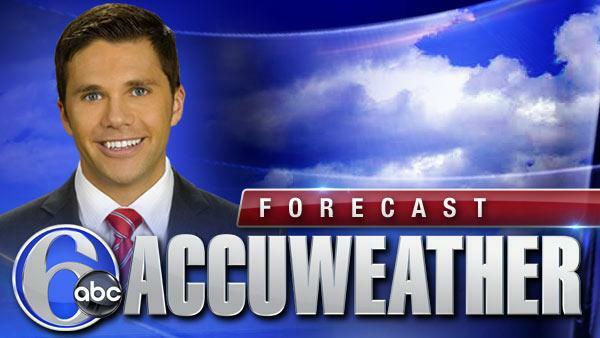 Incidentally, another Balch alumnus works in television: Adam Joseph, a meteorologist at WPVI, the ABC station in Philadelphia. 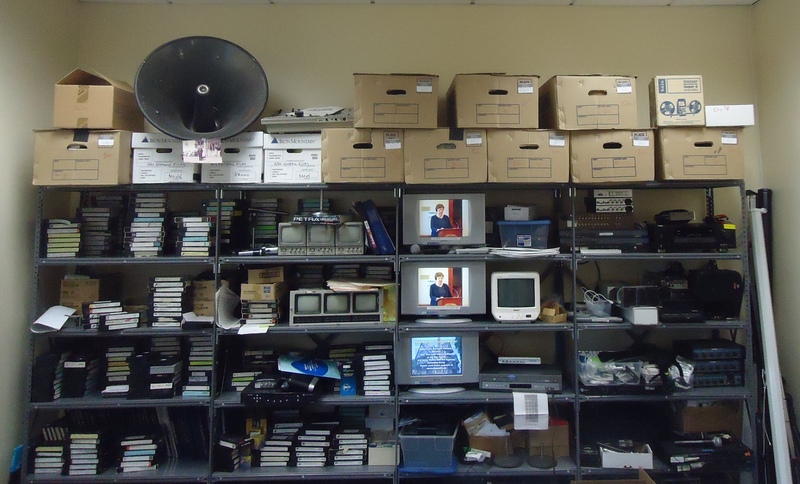 Old tapes and film at NPA. I’m in there somewhere. After my tour of NPA, Jack took me on a tour of our elementary school, where that ancient film of me was shot so many years ago. As we walked up the front stairs, Jack said to me “wait until you smell this place…it has a unique, familiar smell.” And it did. It’s hard to describe, sort of a combination of old hardwood floors, cafeteria food, and perhaps a chemical from a copy machine. Whatever that scent is made of, it brought back a flood of memories. Living in town of course, Jack knows everybody, and as he rifled off names, I instantly remembered every one of them, even after four decades. Memory is a funny thing. All the teachers we had are either retired or dead, but Jack and I did see one of of our classmates, Patty Drake Wheeler, who is now a teacher there. The building, though, really hasn’t changed much and it was comforting to see it exactly the same way as I remembered it when I went here from grades 3 to 6. 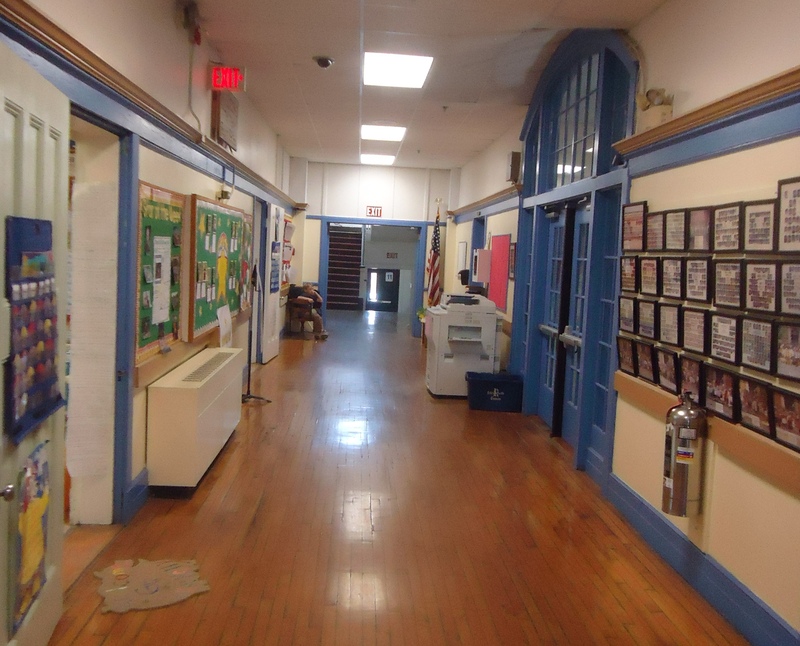 The tin ceilings, the century old oak flooring, and the tiny gym are like a time capsule. 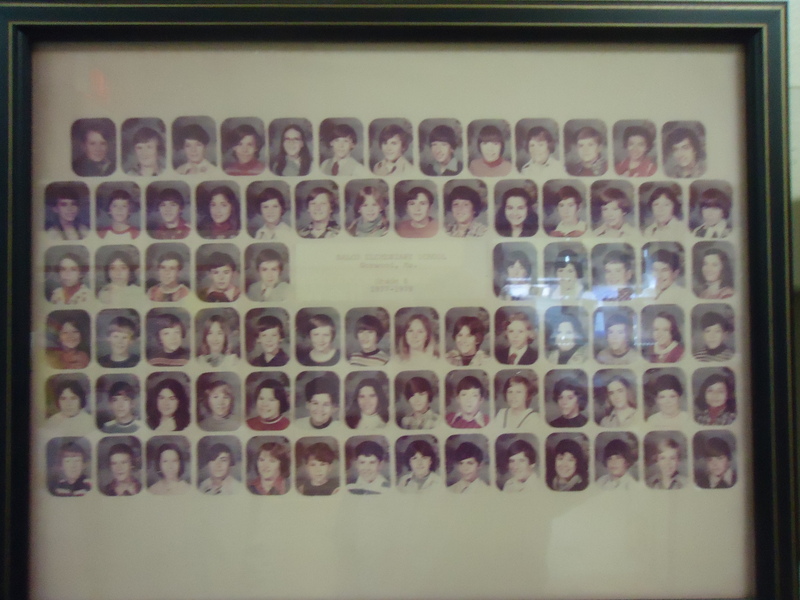 We were disappointed our class picture is missing from the wall of the hundreds of students who have gone here in the past 99 years. My brother’s class is hanging there. We were told the missing classes might be in boxes in some storage room. My grandfather went to school here in the 1920s, so maybe his class picture is packed somewhere ,too. The Balch turns 100 years old next year, and I am sensing another NPA documentary. 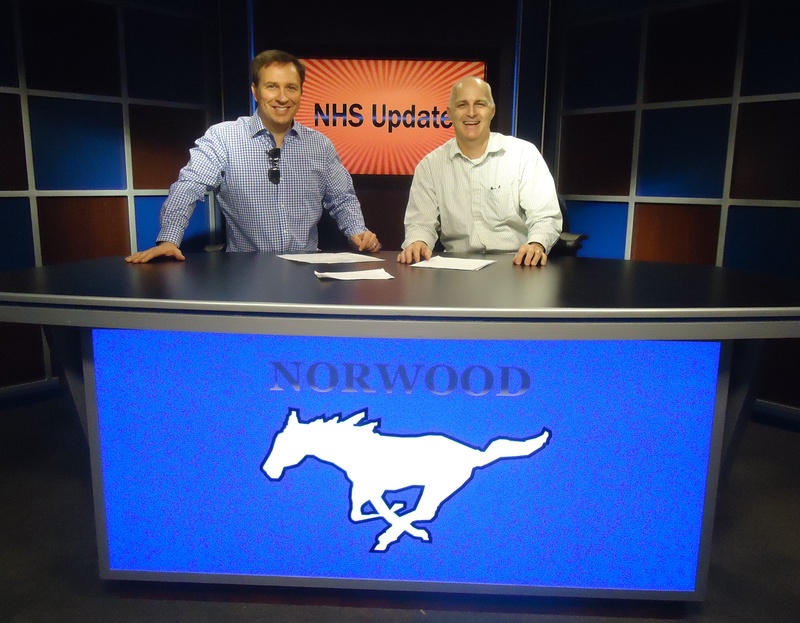 By the way, the folks who built the new NPA studio are the same folks who recently gave a facelift to the WFSB studio: Mystic Scenic Studios of, where else….Norwood. 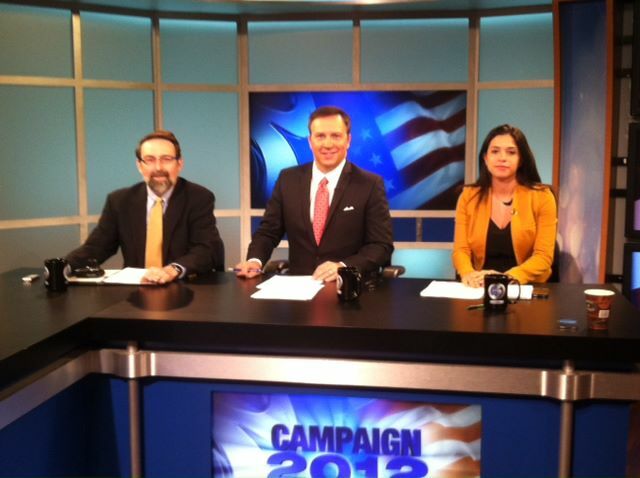 Sunday’s Face the State Republican senate debate featured Mark Pazniokas of the Connecticut Mirror on our panel. Mark is a native, of you guessed it, Norwood. 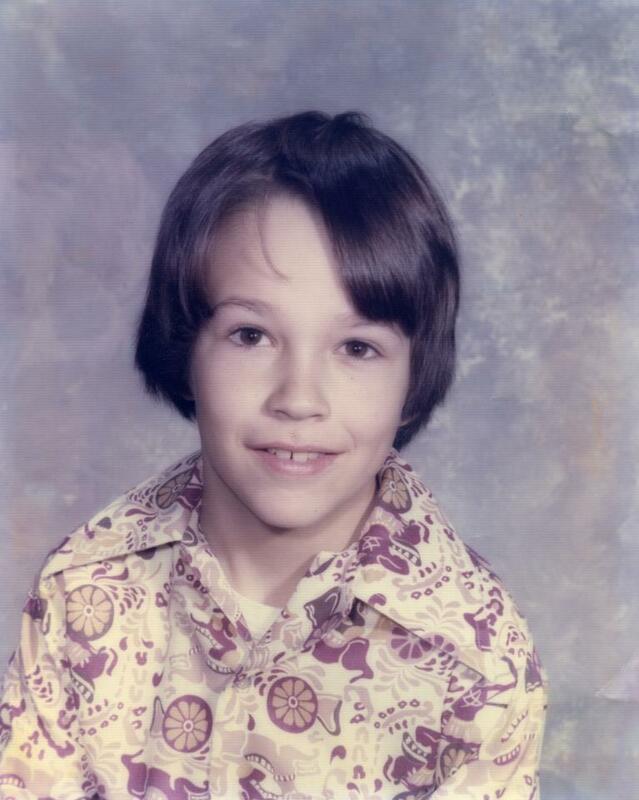 WFSB studio lighting guru Dave Chmielewski is often seen wearing an “Ernie and the Automatics” t-shirt. That band, which performed in our Better Connecticut studios a while back, is from Norwood. Norwood’s very own Mark Pazniokas at the WFSB GOP senate debate. The Wall Street Journal’s Shelly Banjo is not from Norwood, but wishes she was. Dennis, Love this! Norwood, there is something about it! Dennis, Love this! 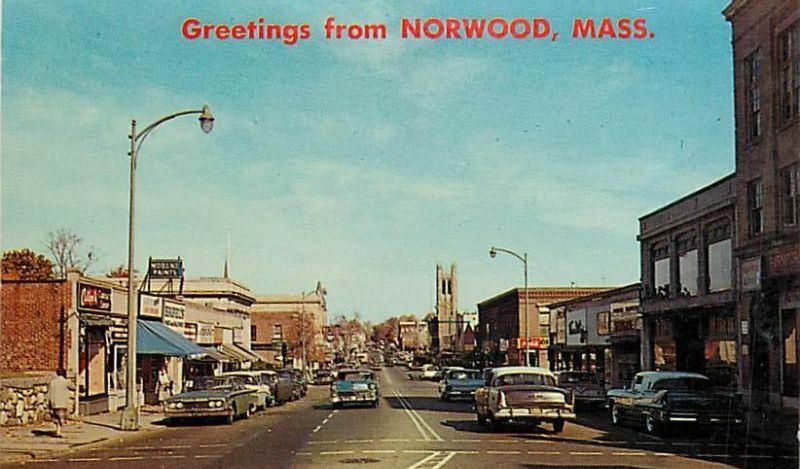 Norwood….there is something about it!!! Carrie, It is a place like no other! I remember Mylod Street well. My mom lived there as a child in the 1940s. Jack, great to hear from you!! Hope you are well. My dad went to the Balch School, way back in the 1920s. They grew up ‘down the Flats’ and so did I, till I was about five years old. I wonder if there might be a photo of my dad’s class. 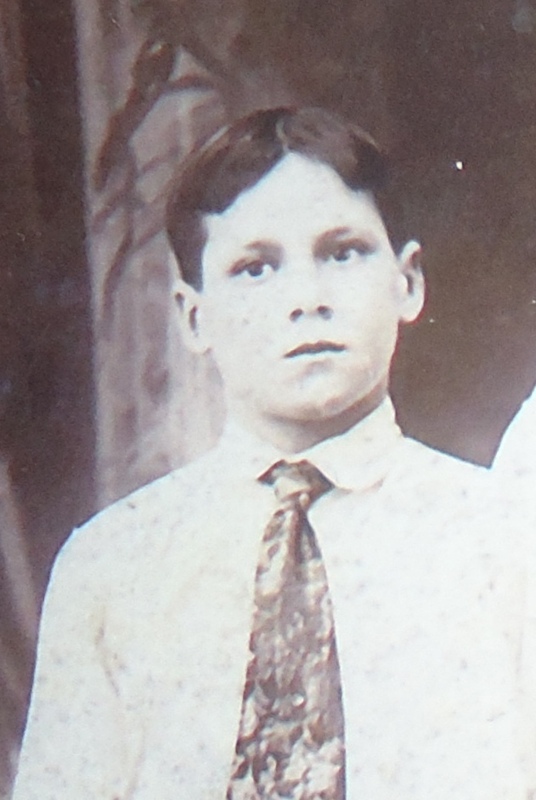 He was born in 1918. Unfortunately, he died last year (in good mental health, luckily). He loved growing up there and going to the Balch. 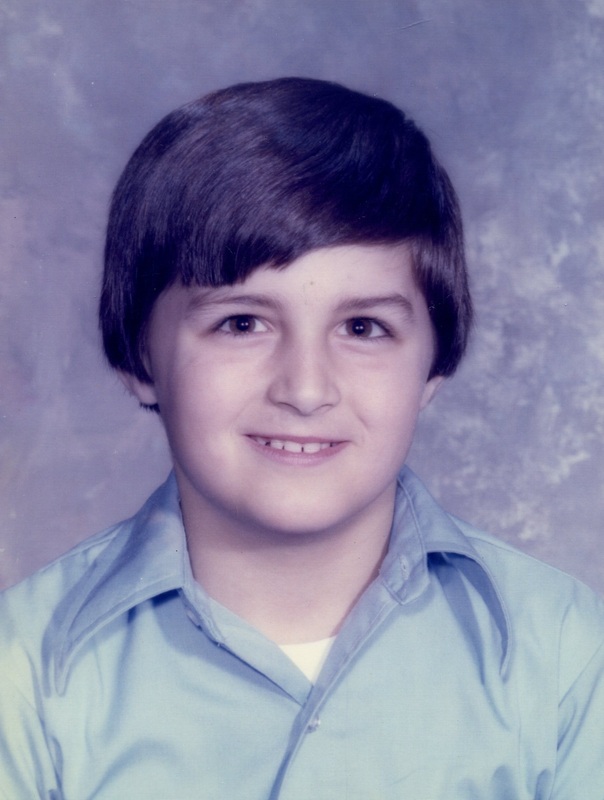 Me, I was a Winslow and West School gal. 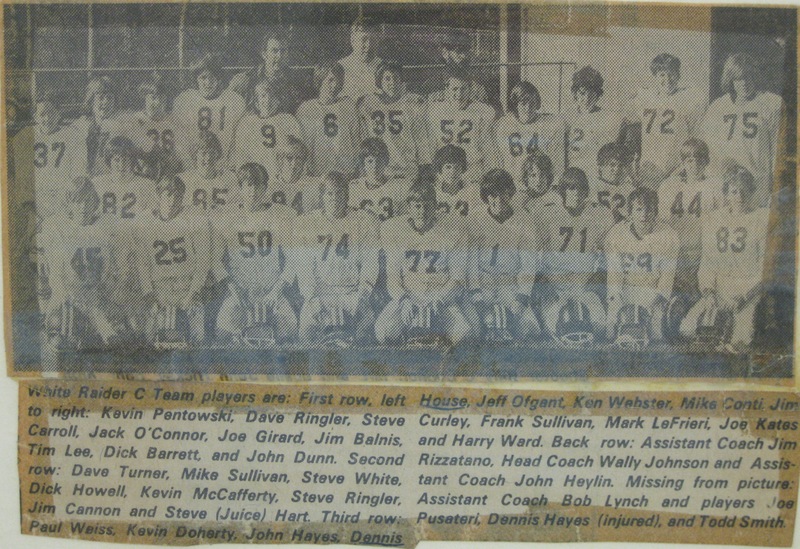 And graduated from Norwood High (also way back when — 1964).